Check out the awesomeness in these gorgeous colors! 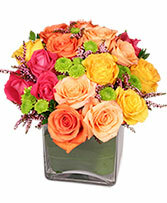 Four varying colors of roses with green and pink chrysanthemum, and upscale foliage that adds style! Breitinger's imports from South American Rose Farms with Fair Labor & always the finest! 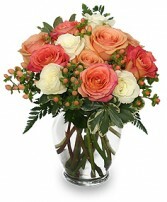 Show some love in North Huntingdon, Elizabeth, or any of our delivery areas with this elegant 7" ginger vase overflowing with lush green foliage to nestle around your beautiful mixture of white roses various peach & bi-colored, coral, and salmon roses. studded with peach hypericum berries. Breitinger's imports from South American Rose Farms with Fair Labor & always the finest! Hello yellow! A dozen big, bold, sunshiney roses are the surest way to brighten anyone's day. 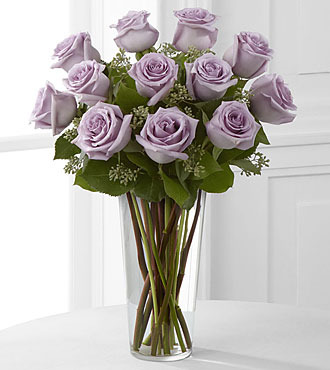 These beauties are delivered with fresh greens in a graceful glass vase. 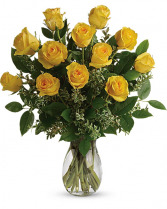 This sunny arrangement features 12 yellow roses with added ornamental greens. ***Photo shows all roses in front, they are spread around the back too in actuality. If you want this fulerl look shown, choose "Price #2, for 18 roses.